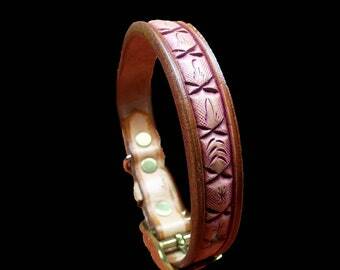 Leather dog collar is custom tooled with a Celtic/Norse theme that would be great for pitbulls, Border Collies and beyond. Medium to large in size. It measures 2" wide with 1 1/2" stylish tapered ends that are finished in black and yellow spirit dyes. 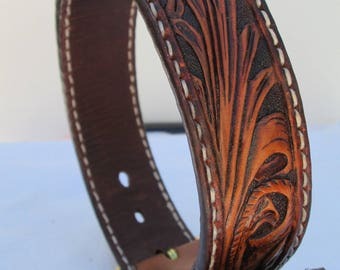 It's hand tooled, oiled, edges beveled, airbrushed and hand painted. For best fit is 16.25". There are five (5) holes on 1" centers starting at 14.25 - 18.25. 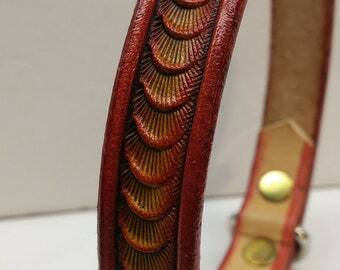 It's comprised of a 13 oz strap of saddle skirting leather and glued to a strap of 2 - 3 oz. 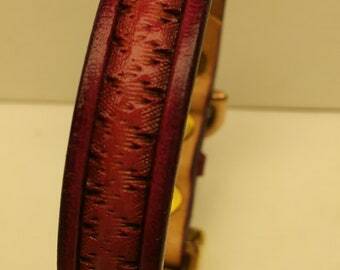 vegetable tanned leather for the ultimate finished look. 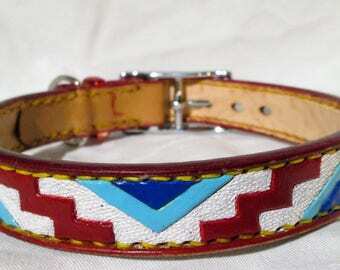 It a very sharp collar! The center bar buckle is solid brass, a welded metal d ring, and a matching leather keeper. It's hand stitched with waxed linen thread then edges burnished to perfection and what I pride myself on. Finally, the collars entirely coated with a poly top finish to guarantee years of beauty and service. 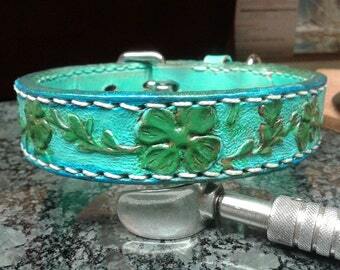 Thank you for coming by and checking out my Celtic medium to large custom tooled leather dog collar. Wow, just wow! If I could leave 20 stars I would! First, Larry is a serious craftsman. He works with you through the whole design and creation process providing amazing advice. The final product is incredible! I will be ordering from Larry again AND I highly recommend his shop!